Why do I get the distinct feeling that this was inspired by the recent BP oil disaster? Sanrio Employee 1: Did you see that oil disaster in the Gulf of Mexico? Sanrio Employee 2: Yes, it’s a shame that something so trivial is getting so much publicity instead of Hello Kitty. Sanrio Employee 1: Is there anything we can do about it? Sanrio Employee 2: Hey, I have a great idea. Why don’t we create Hello Kitty motor oil so that Hello Kitty isn’t overshadowed by BP? Sanrio Employee 1: Wow, what a great idea! Because, seriously, what self respecting Hello Kitty fanatic would be willing to put regular old motor oil into the engine of their Hello Kitty vehicle? 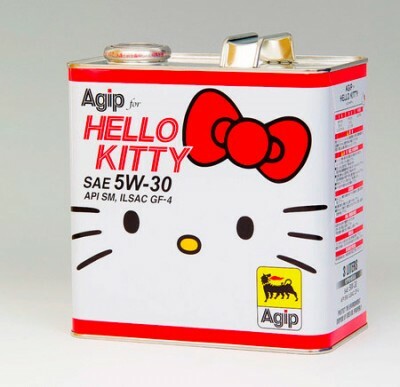 Make your engine purr with Hello Kitty Motor Oil(tm)! I want that but I don’t have anything that goes with it. lol. What you need for your Hello Kitty car or hello kitty molotov cocktail. Still this bothers me, I worry about Hello Kitty brand is being overexposed. Destroy the environment in style with Hello Kitty Motor Oil! I’m not surprised to see this. I’m curious to find out what Sanrio won’t sell with HK on it. oh no…. we’re all doomed…. the world as we know it is definitely coming to an end… RUUUUUUUNNNNN!!! It is actually a good quality motor oil for gasoline engines (based on the API and ILSAC standards). Do they have a Hello Kitty eletric car yet or Hello Kitty themed solar panel? I’d buy this just for the container.. cute! WHERE CAN I GET IT!?!?!?!?!?!!?? !